One of our goals at OhioPodcast.com is to put the spotlight on small businesses across Ohio. 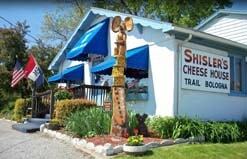 Here, we introduce to you the Shisler Cheese House at the corner of State Route 30 and Kidron Road in Wayne County. Yes THAT Wayne County, right smack dab in Amish Country! We visit with Rita Shisler who’s family has been operating the Shisler Cheese House since the late 1950s. Rita is one of the area’s best ambassadors when it comes to knowing what to do and where to go. Rita talks about all the delicious locally made cheese, meats, chocolates and more that you’ll discover at Shislers on your trip down the road into Amish Country. And you’ll get some great holiday gift ideas at Shisler’s Cheese House too! We really appreciate everyone who has liked, followed, retweeted and shared our podcasts on Facebook and Twitter, and we hope you’ll do the same with this one too. You can get every episode downloaded for free by clicking on the iTunes subscribe button.